Being my first trip to Glacier, I pretty much stopped at every single overlook, pull out, parking lot, and trail head I came to. When I stumbled onto this scene later one afternoon I immediately thought it would make for a really nice vertical crop. This spot, right off of Going-to-the-Sun Rd., is best photographed when the whole area is in the shade and you can use a slightly slower shutter speed to help create texture. 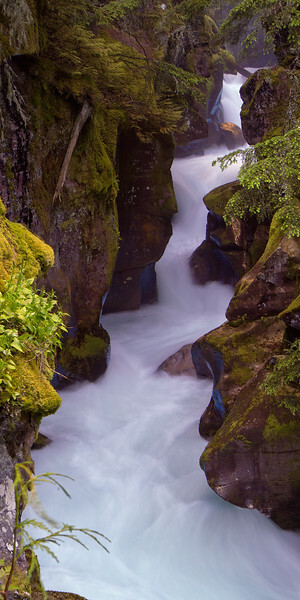 The use of a "blue and gold" polarizing filter helped to bring out the beautiful color of the water. 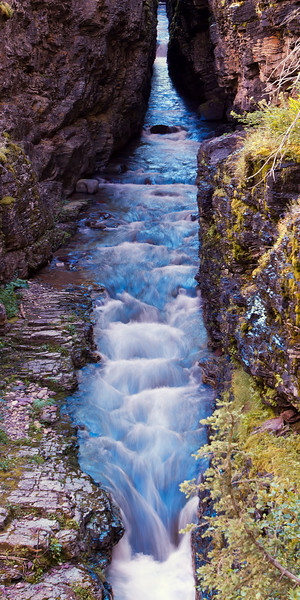 Glacier is known for it's amazing blue and emerald lakes and streams, the color of which are attributed to the sediments in the glacial runoff that feeds most of it's waters. 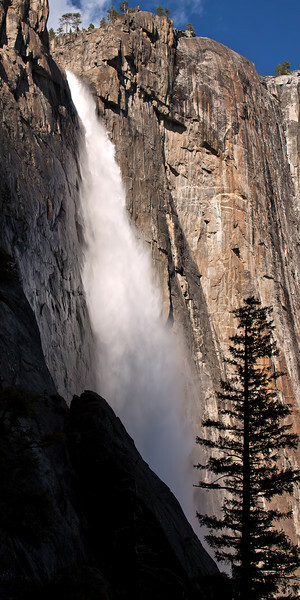 Here Upper Yosemite Fall is bathed in afternoon light. When the sun sets in Yosemite Valley it's granite walls quickly recede in a deep dark shadow allowing me to create a silhouette with the foreground. 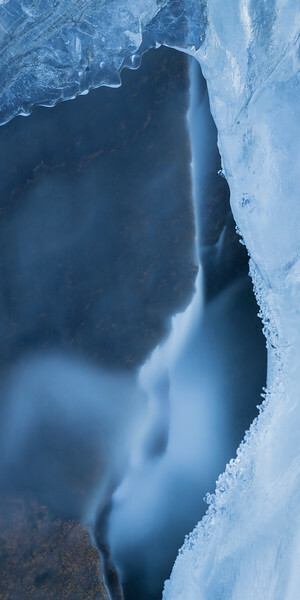 A delicate layer of ice forms over a small cascade in Yosemite National Park. While "clicking" through images on my computer I came across this hidden gem. I call it a "gem" not only because I really like the greens in this and the composition of the photo but because I found this place just 20-30 miles from concrete jungle that is Los Angeles, CA. The overcast and drizzly day provided a nice saturation to the algae growing in the falls and also allowed for a long exposure giving the water a nice cloudy flowing look. This is the scene on a typical spring day at beautiful Lake Tahoe, CA. As one local there put it to me - "Yeah, I'm lucky enough to live in paradise." 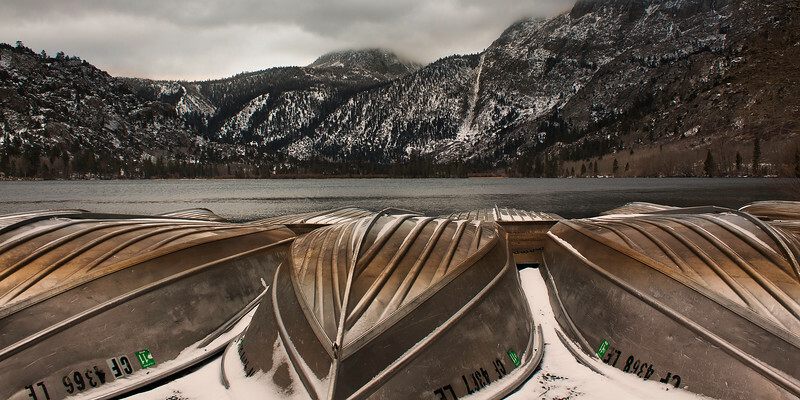 These row boats lined up along the banks of Silver Lake made for a great foreground subject. Arch Rock is found in the jumbo rock area of the park and is one of Joshua Tree National Park's most interesting rock formations. 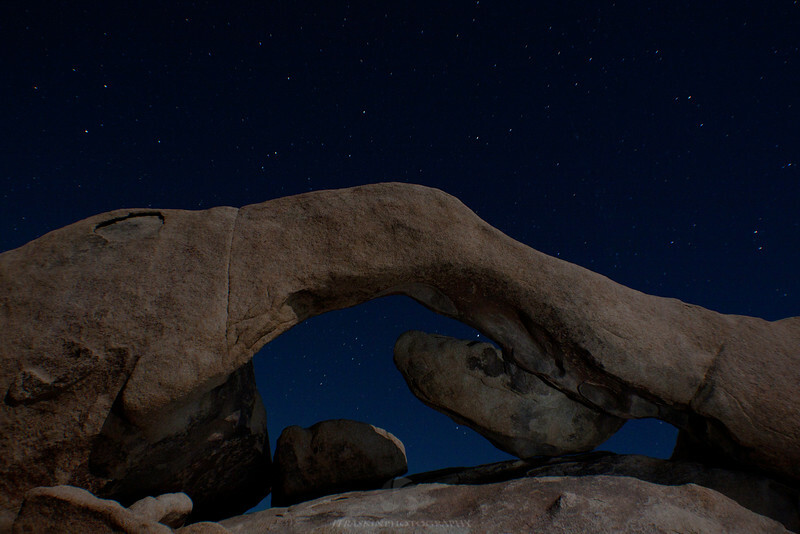 There was enough moonlight for me to capture the details of the arch and still expose some of the stars. This unique rock in a remote area of northern Arizona is a testament to the power and forces of mother nature that created it. Notice the geological line that passes right through the rock and onto the rock wall behind it. 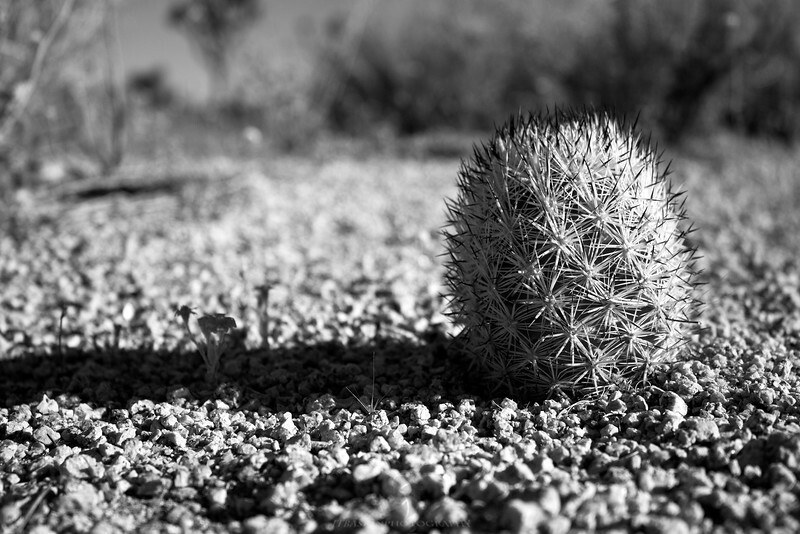 This is an image from a recent return trip to the Page, AZ area. 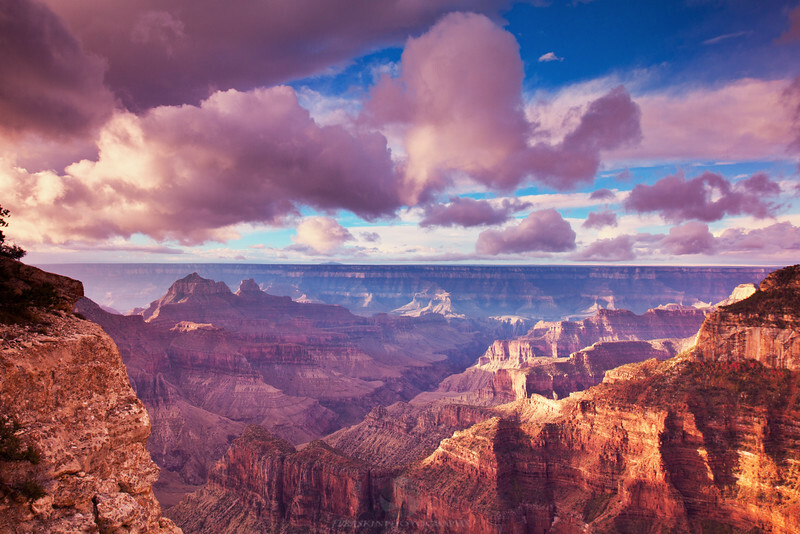 The whole region is full wondrous and amazing desert landscapes including the world's most famous slot canyons Upper and Lower Antelope Canyon. On my first trip to the area we visited the upper canyon where you can only gain limited guided access on a payed tour through the canyon and I wasn't quite satisfied with the experience or the photos. I learned then that if you go to the lower canyon instead of the upper you can get unguided access for hours at a time to explore the amazing canyon. 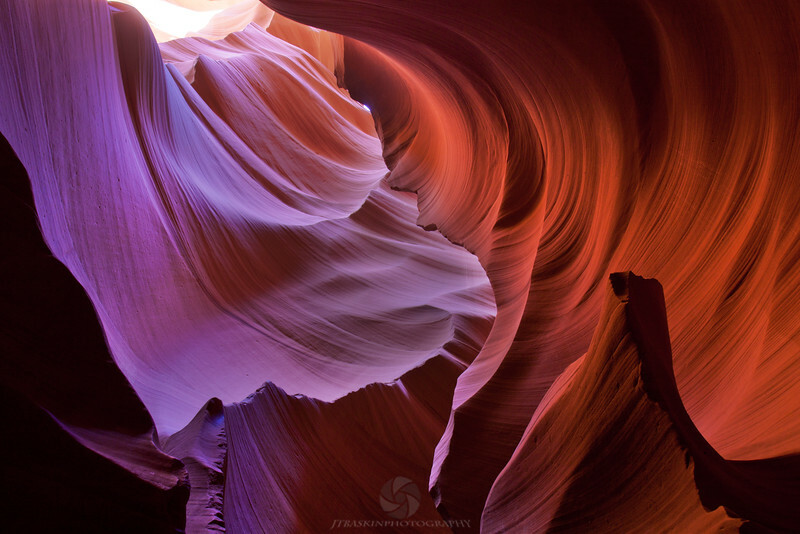 With the freedom and time to really play with compositions and exposure times I was hoping to to get some better shots of the mystical colors and patterns in the canyon walls. And with the thought of the thousands of people that photograph here every year, I knew that I would have to search pretty hard for something unique. For this shot I ended up on my back with my camera just inches above the sand in an effort to compose the scene. 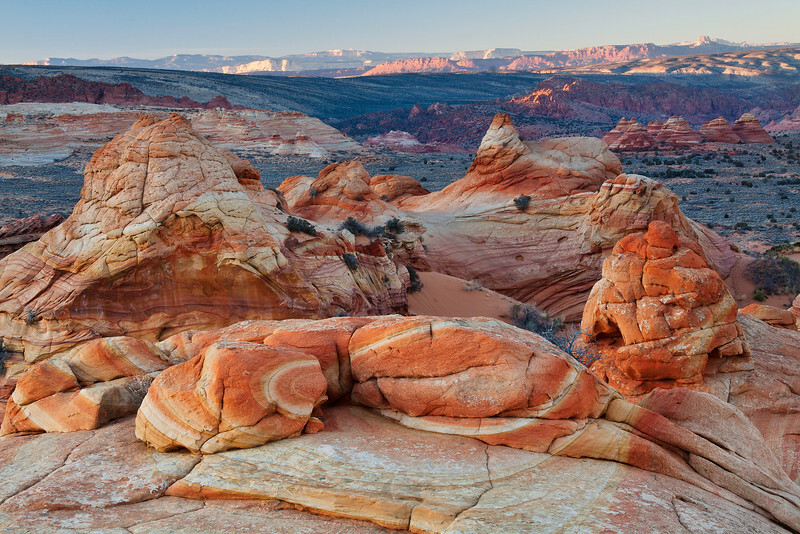 This sandstone formation known as "the fire wave" was photographed about forty five minutes from Las Vegas, in Valley of Fire State Park, NV. 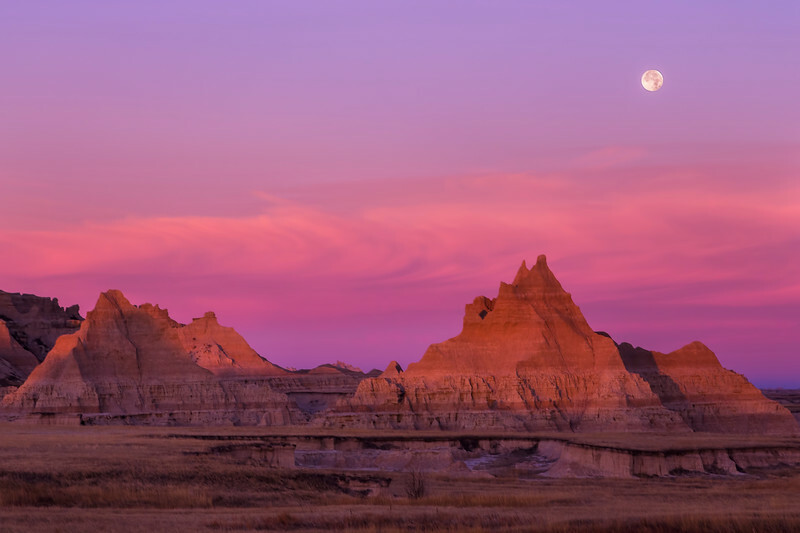 I was astonished by the vibrant colors and interesting patterns found here, I would have like some more cloud cover and maybe some color to the sky, but I found that making this formation fill the frame worked pretty well too. 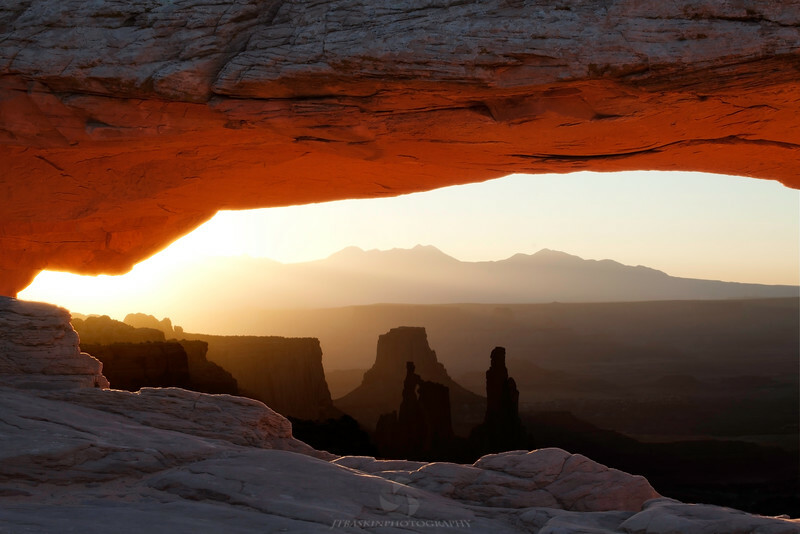 Mesa Arch in Canyonlands National Park is a premier sunrise destination for photographers. 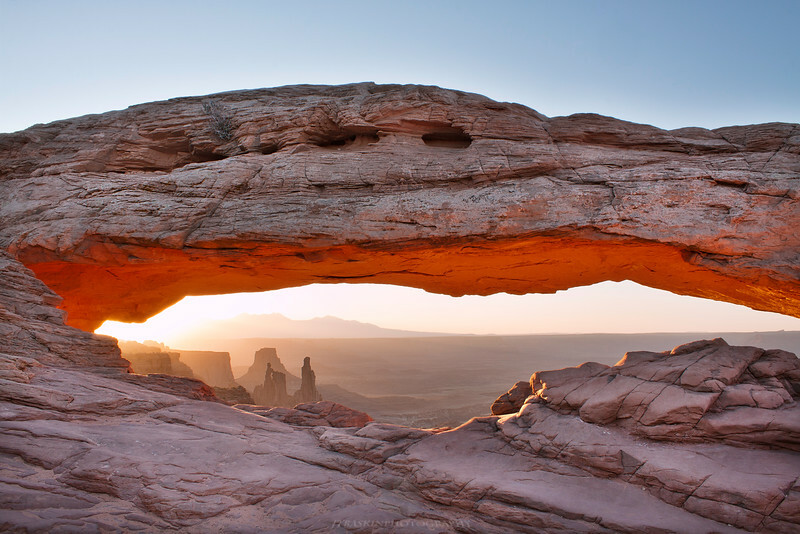 Pretty much every morning the underside of this sandstone arch catches fire with the first rays of light from the rising sun. 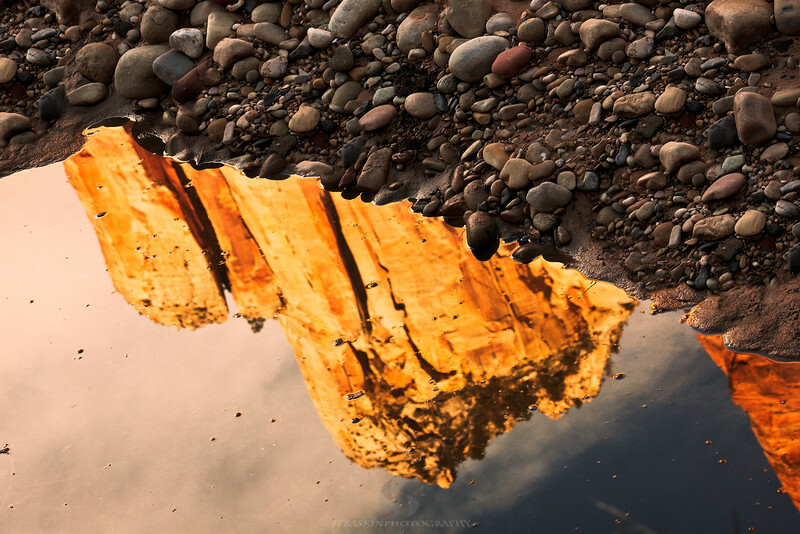 If you are ever in the Moab, UT area you can't miss this natural phenomenon. This is my favorite shot from a clear August morning I spent in Utah. I named it after the rock formations and mountains framed by the famous arch. 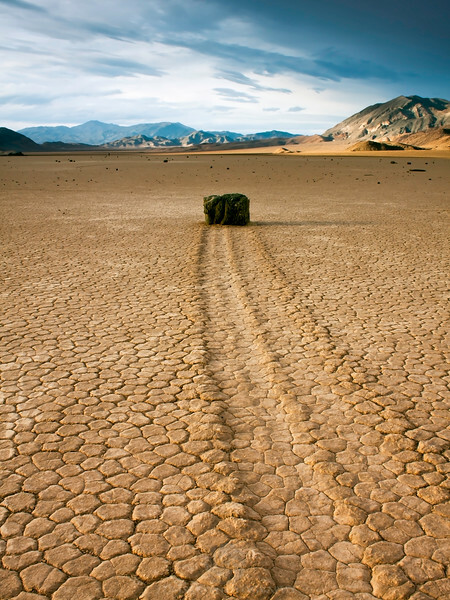 This is an image of the famous "racetrack," in Death Valley National Park, where for decades no one could explain how the rocks would seamlessly slide across the desert floor. 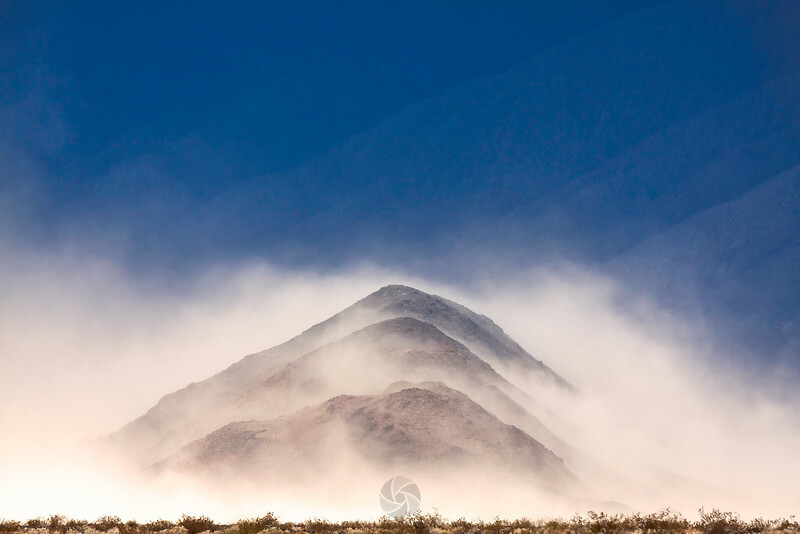 This scene was captured during a massive dust storm in Death Valley National Park. I consider this image to be one of my favorites because I had scouted this spot many times before and knew I would have to catch in a dramatic atmosphere in order for the scene to have any real interest or depth. 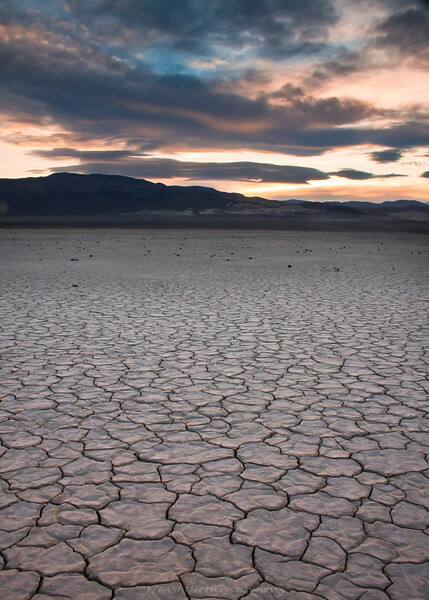 I came to Death Valley on this trip with this shot in mind just because it was supposed to storm so heavily. Finding an undisturbed section of dunes at "mequite flat" can be difficult at times to say the least. 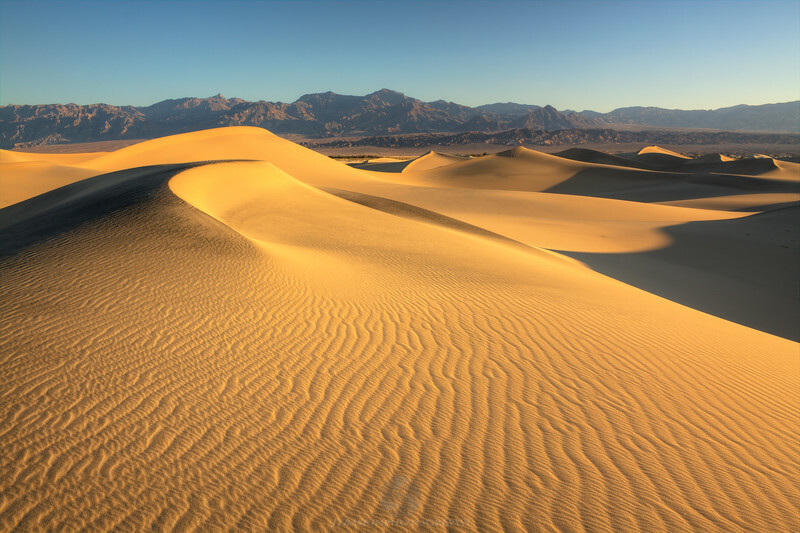 Here you see Death Valley on a typical bright harsh afternoon. 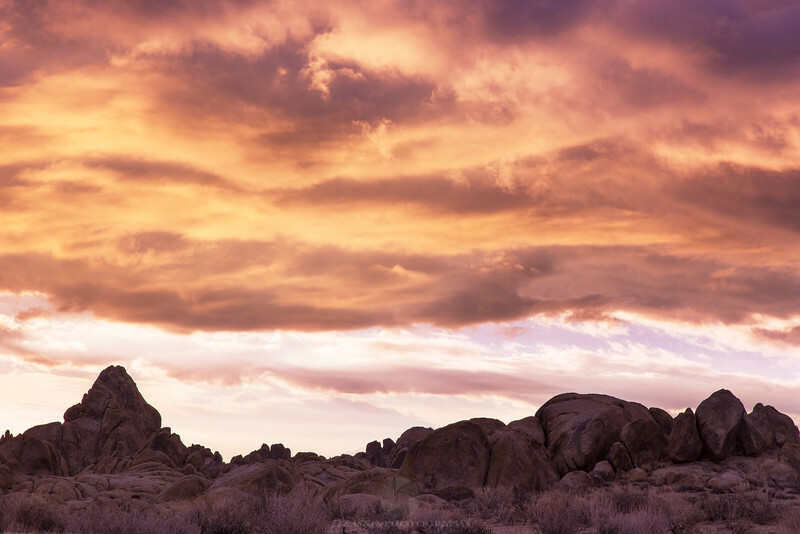 As the sunrise's low angled rays of light strike these layered clouds over Alabama Hills, they reveal marvelous colors, textures, and patterns in the sky. 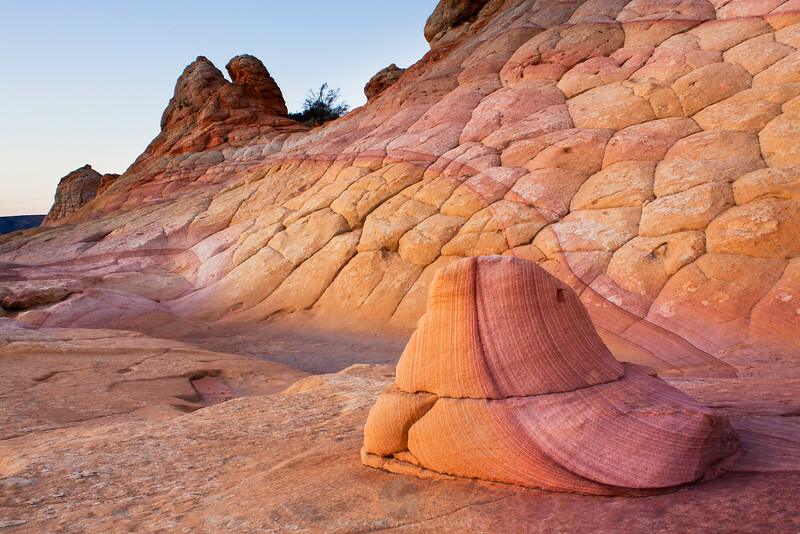 Years and years of erosion left these tee-pees or, as my wife calls them, "swirlies" all over the Coyote Buttes area of AZ and Utah. I was blown away by the almost perfect circle left in these particular rocks. 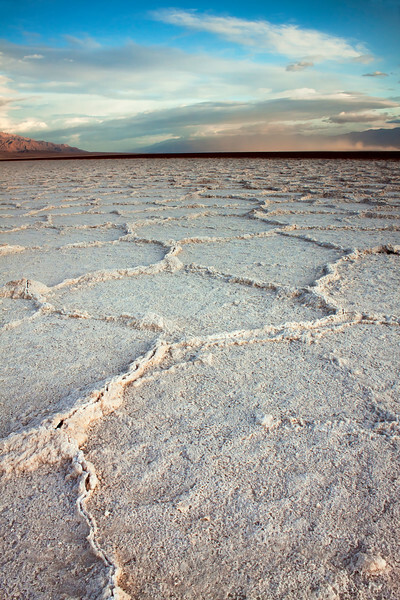 Badwater's huge salt flats stretch over 200 square miles, making it one of the world's largest protected flats. 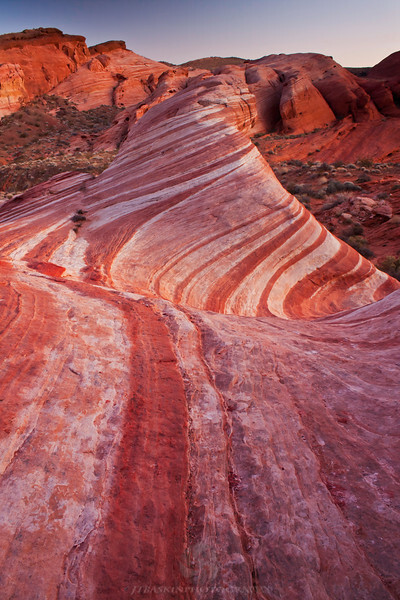 Here salt crystals expand in the extreme climate and push the crust of the desert into rough, chaotic forms. Often times resulting in these famous polygonal patterns. On a recent trip to the north rim of The Grand Canyon, I was treated to a most impressive weather system rolling in and the out of the area. I saw awesome cloud formations, rainbows, lighting, and even the Grand Canyon's first snow storm of the season. The day before this the canyon rim was buried in 4+ inches of snow. I was able to capture this image as that same snowstorm cleared early the following day. 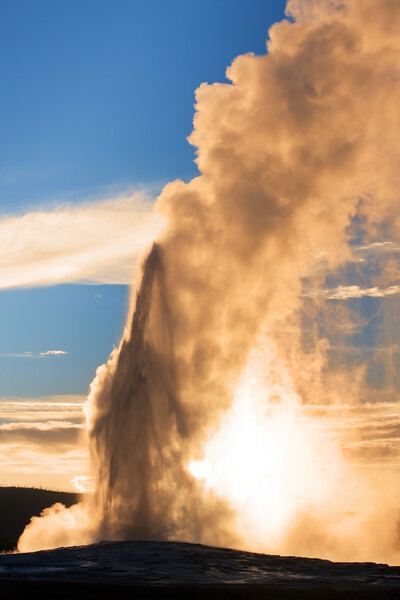 Any one that has made it to Yellowstone probably knows that Old Faithful erupts about every 90 minutes and usually only last around eight minutes. Starting in the late afternoon on this day, I waited around for the famous geyser to go off five times. That was almost eight hours with not a lot time to do much else in between eruptions. I wanted to catch it in a variety of light and even took some night shots of the famous landmark, although this is my favorite. 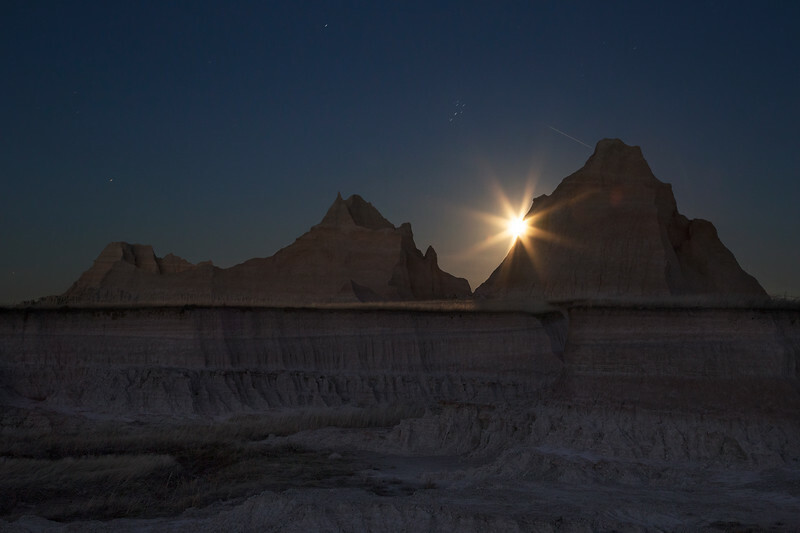 This is the full moon rising on the one night I got to spend in Badlands. I had tried to use my 500mm lens and take some close ups of the moon sitting on the horizon but was not able to capture anything remotely close to what I had wanted. So i packed up my gear in search of a wider composition when I found this spot. 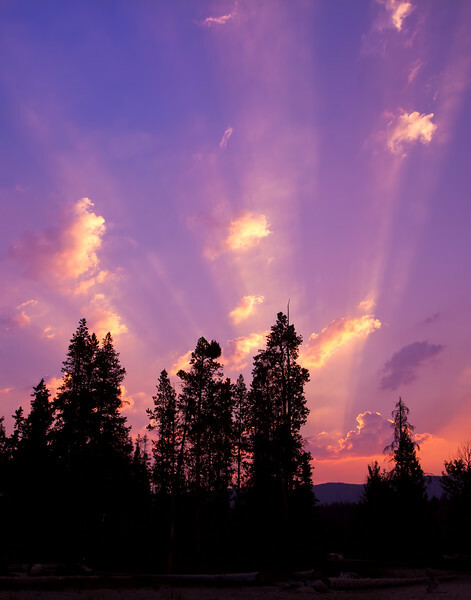 I was shooting on Red Lake in the Sawtooth Mountains for what I hoped would be an amazing sunrise. I set up and waited...and waited... and waited. It was almost like the sun didn't want to rise. The sky and clouds to my west never "lit" up at all and the peak, that was so nicely reflected in the water, never caught a glow. I was really puzzled. Until I turned around and saw this scene in the sky to the east. I immediately remembered that there were wild fires in the area and realized that the smoke in the air had to be blocking out most of the "good" light. Fortunately the before mentioned smoke turned all kinds of shades of pink and red and left distinct rays of light in the sky. After a week in Yellowstone during peak season we had our fill of people and crowds. 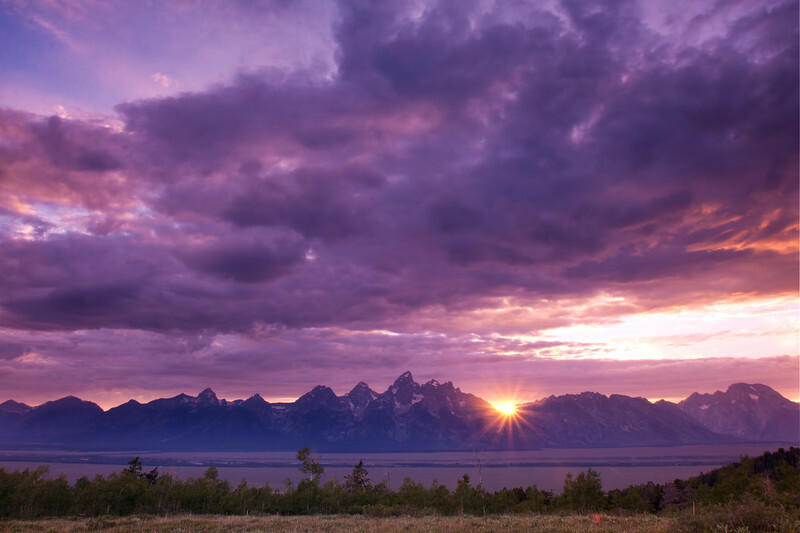 So upon arriving in the Tetons we made it our mission to find some dispersed camping in an effort to immerse ourselves in nature and get some solitude. Shadow Mountain National Forest was exactly what we needed. No cars, kids, or bicycles passing by every few minutes. Not to mention no fees and a view that will probably never be matched. This was taken literally feet from my tent! I captured this scene during the sunrise from Jenny Lake in the Tetons. 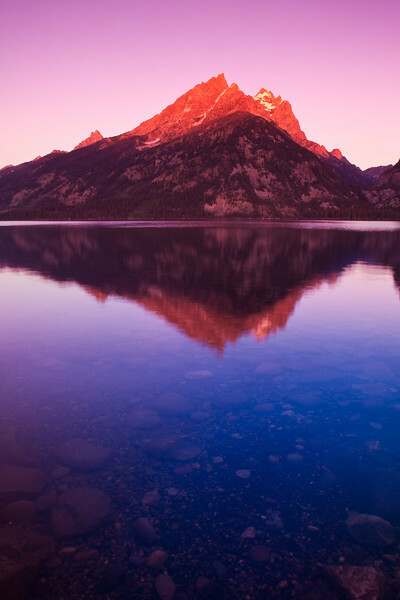 I was drawn to the deep dark blue water and the alpenglow falling only on the upper portion of Grand Teton peak. 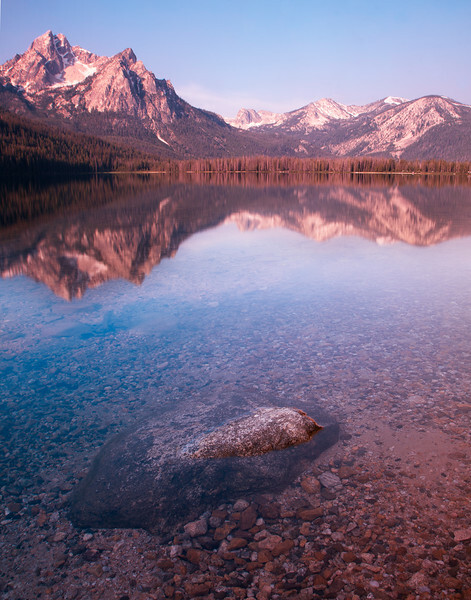 Stanley Lake in Idaho offers unmatched views of the surrounding Sawtooth Mountains. I captured this on a clear summer morning while passing through the area. 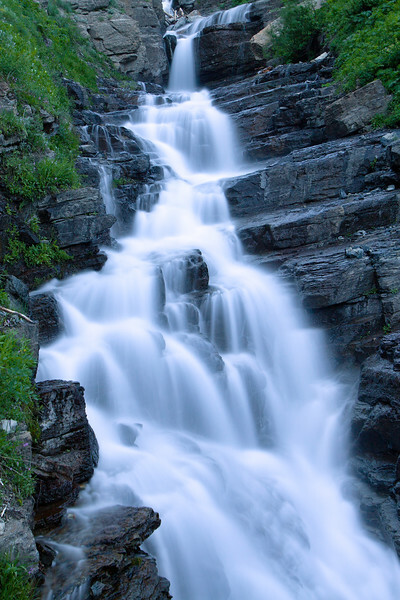 One of the first things I noticed about Glacier when I arrived there was the waterfalls, over two hundred year round and literally countless during the spring run-off. They are everywhere around this time of year. 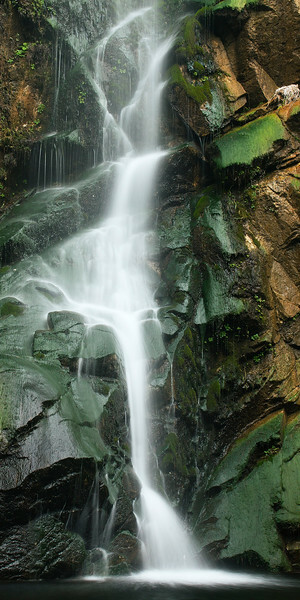 On some mountain slopes there were four or more cascading down just one of the steep hillsides. 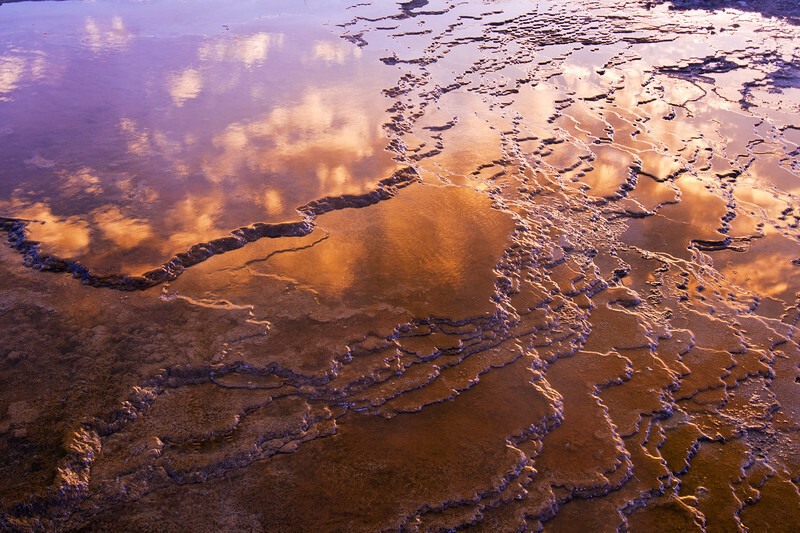 Of all the photographic possibilities in Yellowstone, a nice sunrise shot with some reflection at Mammoth Hot Springs was top of my list. Unfortunately the area wasn't quite what i had envisioned and the main boardwalks were not providing the kind of shot I wanted. Luckily, I managed to find this spot not far from the main hot springs. It was definitely off the beaten path and not disclosed to the public. The work was well worth the effort though when I came away with this shot. 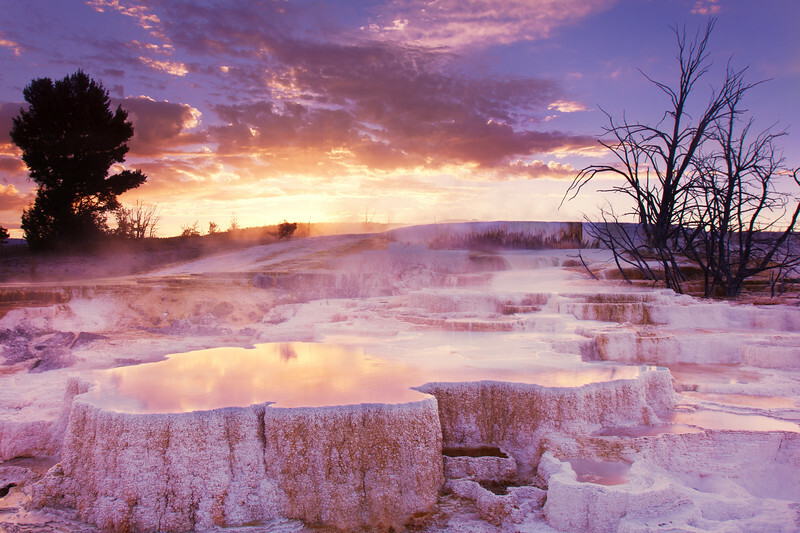 I was able to showcase the complex but delicate hot spring formations and I even caught some reflection to boot. Getting to spend intimate time with such an amazing geological wonder, a beautiful sunrise, and horrid smell made this morning truly unforgettable. 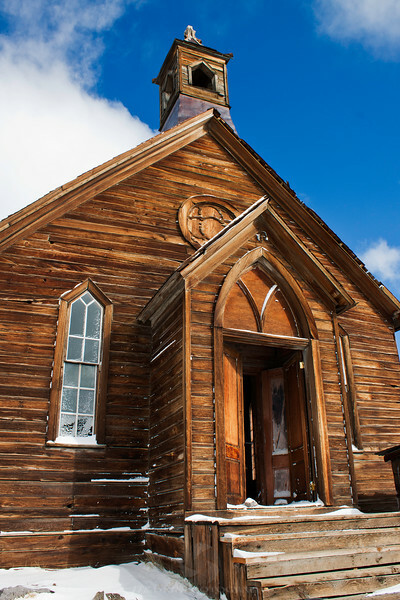 While visiting Yellowstone, I was frequented with bright blue and lifeless skies most of the days. However when we visited The Grand Canyon of Yellowstone a few large puffy white clouds were hanging around. I set up my composition and waited for the sun to get dimmed by a passing cloud creating a nice even light and eliminating any underexposed shadows in the scene. I was going to stick around and try to catch the infamous rainbow that appears in these falls on some mornings when conditions are right, but after the third tour bus full of travelers filed onto the overlook and keeping people from bumping me or my tripod became impossible, we opted to move on to some less popular spots in the park. I found these patterns and reflections while strolling the boardwalks at Mammoth Hot Springs. 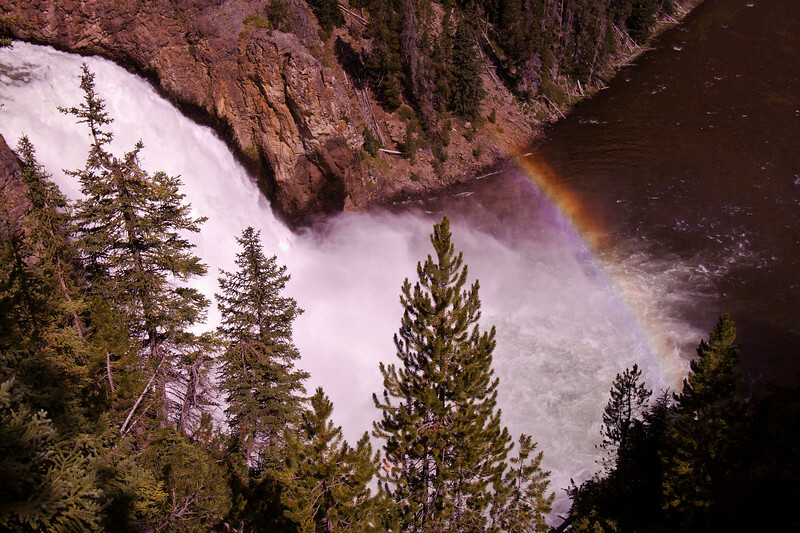 I decided to come the next morning because fighting the crowds in Yellowstone National Park's popular attractions can be difficult to say the least. While Yellowstone may be the original National Park, the much smaller and much less frequented Grand Tetons National Park is a much more appealing place for landscape photographers. This dramatic range of mountains could keep me busy for a lifetime. 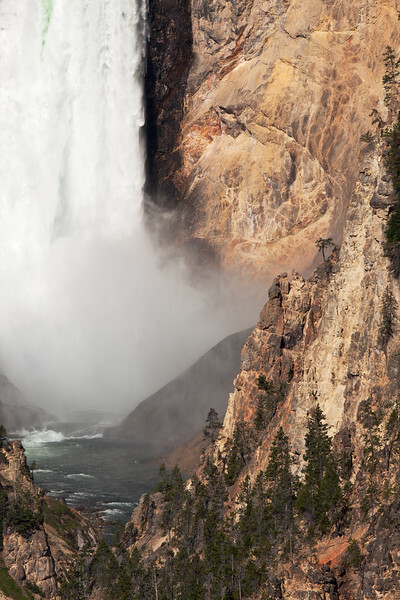 When I visited this popular spot in Yellowstone National Park I had no intentions of doing any "serious" shooting, I didn't even take my tripod. But as luck would have it we happened across this view at that perfect timing when sun and water intersect at that precise angle to create a rainbow. I took a number of handheld "snapshots" and even a few selfies with my wife, I mean we were on vacation too, after all. But something about this scene just keeps grabbing my eye and I wanted to include it in my portfolio because I like the unique composition and the balance between negative and positive space in the corners. 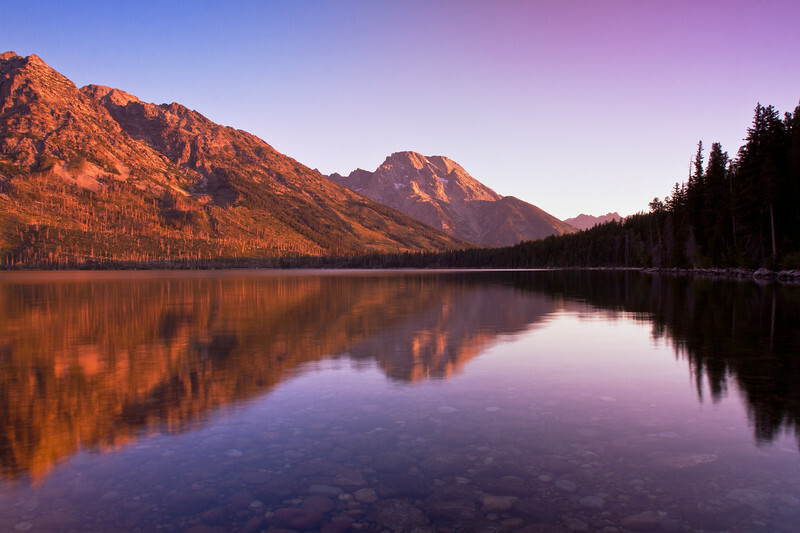 Positioned on the East side of the Canadian Rockies in Montana in the "Many Glacier" area of Glacier National Park, Swiftcurrent Lake is a sunrise shooter's dream. 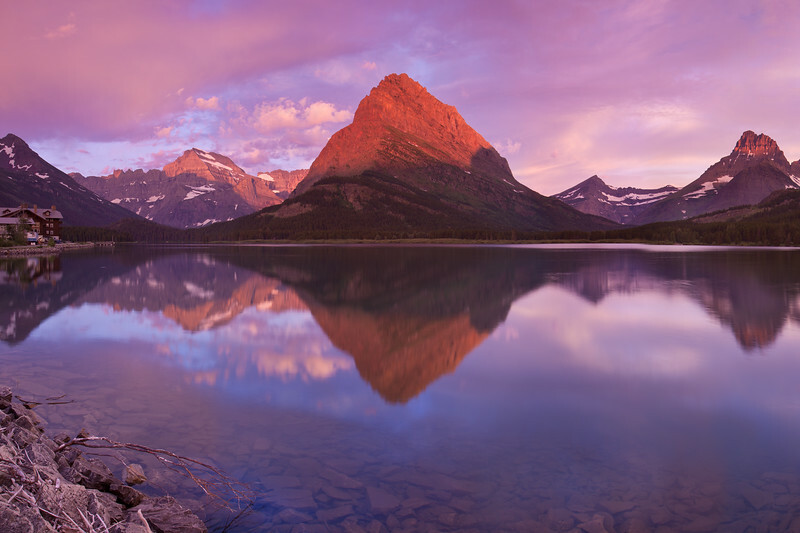 Every morning warm light from the rising sun washes across the peaks and ridges of Glacier in a beautiful display of pinks, reds, and oranges. With the lake's calm water and abundant foreground possibilities, one could shoot here many times and come away with something different each time. 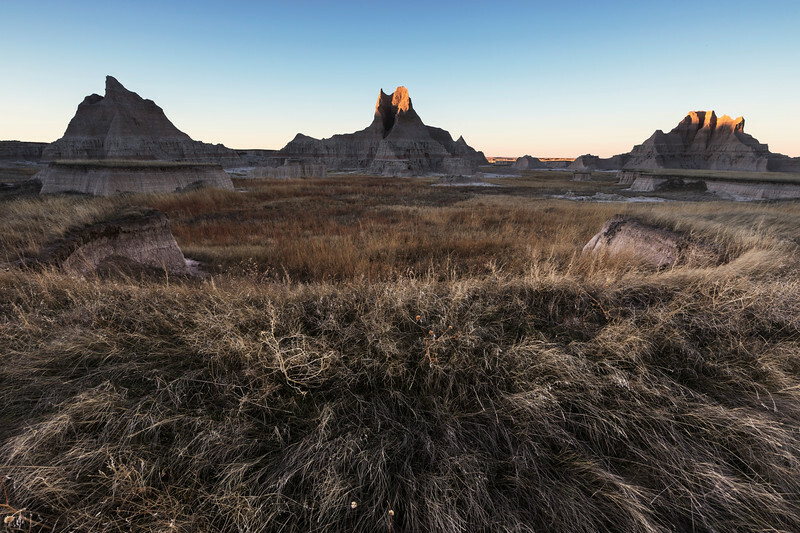 I stumbled into this hoodoo (almost literally) while shooting the sunrise in Badlands. 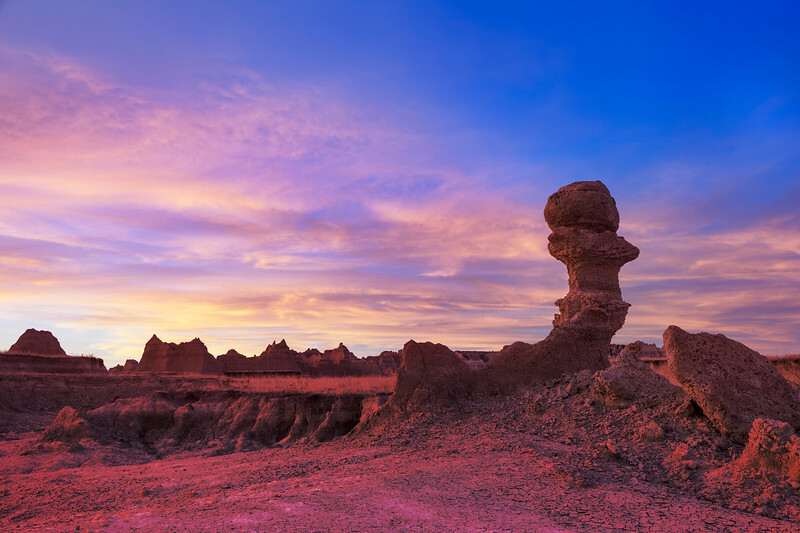 I saw this rock formation towering over me and piercing the beautiful sunrise colors and immediately turned my camera to it. Since it had grown much brighter out since I arrived I used my CPL filter to help darken the sky and make those burning clouds "pop." 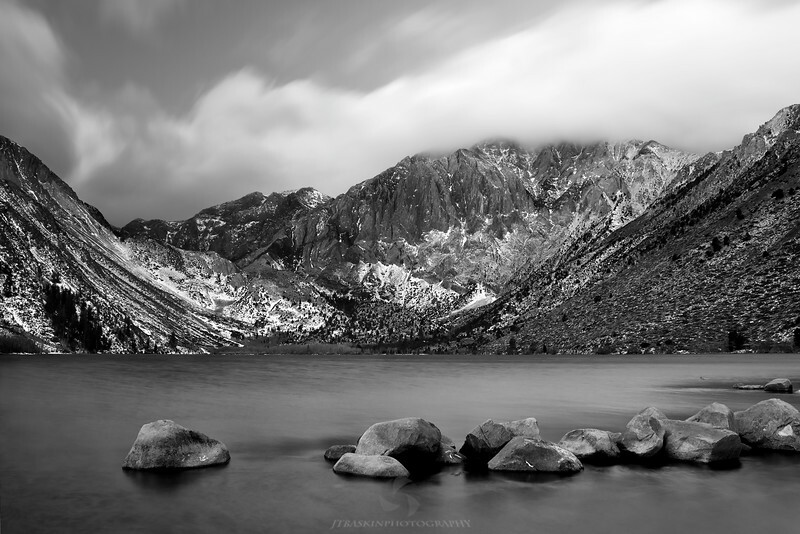 In Mono County, California, just Northeast of Yosemite National Park, lies a fascinating 760,000 year old lake. 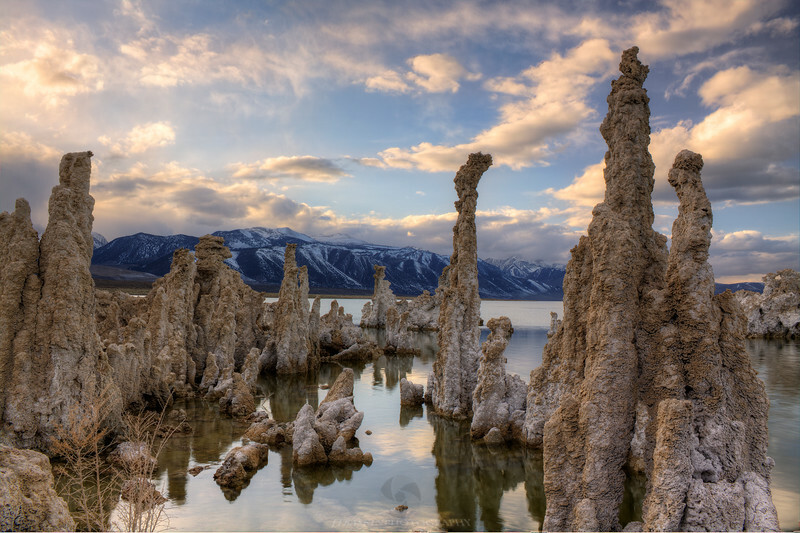 Mono Lake is a shallow but large alkaline lake known for these unusual geological formations called "tufa." At 14,505 ft. this summit is the highest point in the continental United States. Every morning the eastern slope of Mt. Whitney gets hit by the sun's first rays, sometimes creating dramatic apenglows like seen above. This picture was taken just minutes before a fairly harsh winter storm came rolling into the valley. I had never seen Mono Lake this clear and, literally, within minutes of taking this shot the lake turned to rough waters and white caps and the snow started falling. 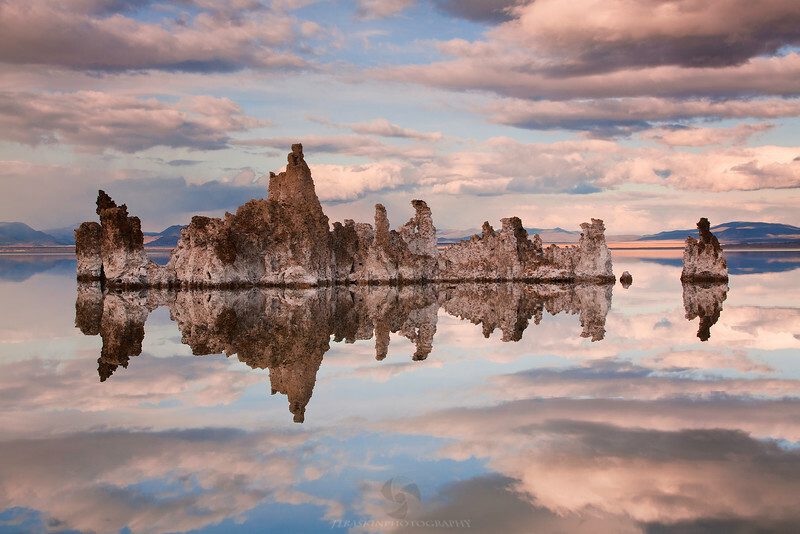 While spending a few days shooting the eastern side of the Sierras, I managed to get back to Mono Lake. This was my fourth or fifth attempt at shooting here and the first time I got any kind of reflections out of the lake. I had never seen such a big body of water sit so still. The surface was literally as smooth as glass. I got some really good shots showcasing the reflections but at the end of the day, I think this was my favorite. I like the perspective and the way you feel like you are surrounded by tufas in the middle of the lake. (which I pretty much was) It took some work to get into this spot and I had to get my feet wet - burrr! 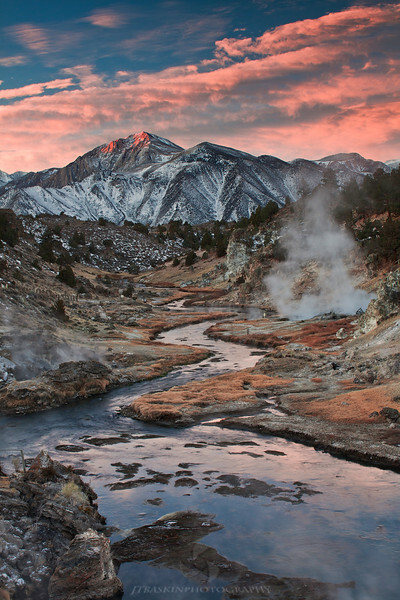 Hot Creek is an active geothermal area and, until recently, it's springs were open to the public for swimming and wading. The backside of the day before's storms lit up nicely for me during this sunrise shoot. 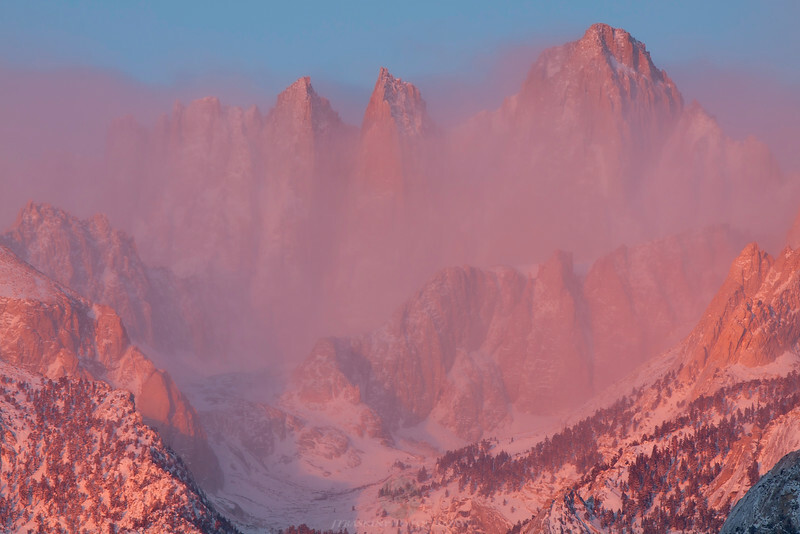 I especially like how you see the first light of an alpenglow upon Mammoth Mountain. 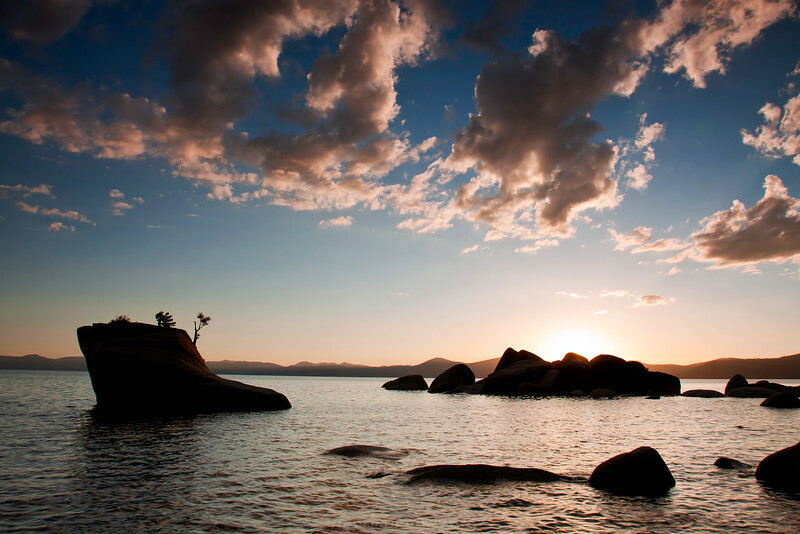 This sunset scene at Lake Tahoe was taken on the Nevada side near Sand Harbor. The rock on the left hand side of the frame is known as "bonsai rock" and is one of my favorite spots on the beautiful lake to photograph. 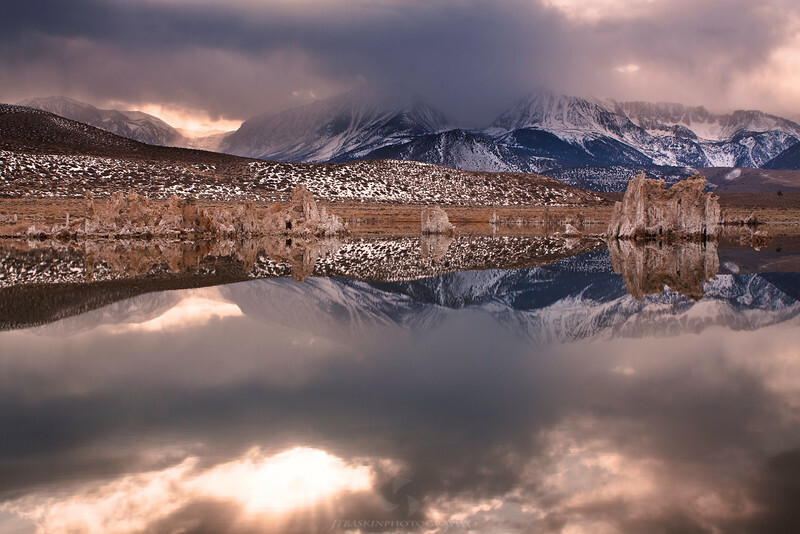 For this sunrise shoot at Mono Lake I opted to leave the lake out of the scene. 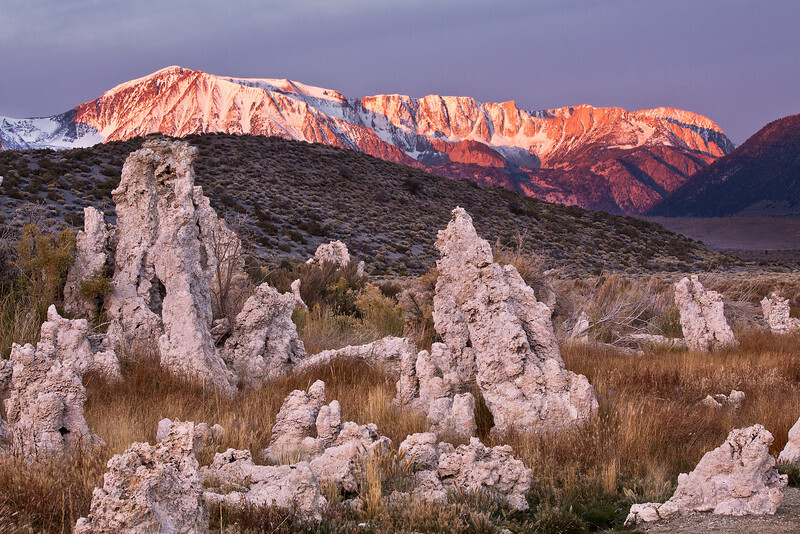 This made the dramatic peaks of the Sierras my main point of interest instead of the tufas that litter the foreground.